Certikin International is planning an extensive double stand exhibitor presence at SPATEX 2015 that will be targeting wet leisure specialists and prospective Caldera Spas retailers with a new Fantasy roto spa range promotion. During the three-day SPATEX showcase, running from February 1 to 3 at the Ricoh Arena in Coventry, the wet leisure trade powerhouse will have two display areas dedicated to its Certikin International product range; as well as distribution exclusivity for the Caldera Spas hot tub brand from Watkins Manufacturing. The Caldera Spas stable, exclusively distributed in the UK by Certikin, achieved a 2014 WhatSpa? Best Buy Award in the £4,000 to £5,999 price category for the best-selling six-seater Marino, which comes in at 213 x 213 x 91cm and has a lounge seat and Acquarella waterfall incorporated in its design. As part of its extensive product promotion, the distributor will be using the event to highlight the introduction of three new Caldera Spas ‘plug and play’ Fantasy Spas hot tubs, including the three-seater ‘Embrace’, four-seater ‘Drift’ and five-seater ‘Entice’, for hot tub retailers seeking out rugged entry-level options, which are dubbed to ‘stand head and shoulders above the rest’ to increase their showroom range. The 240v rugged ‘plug and play’ Fantasy models have the convenience of being able to be plugged into a standard socket to power the topside electronic controls for temperature, lighting, and water flow pressure control convenience. They offer a dual speed therapy system to allow users to enjoy the comfort of warm water while being gently massaged, or have the ability to increase the power for a more vigorous deep-tissue massage. With its diminutive unique shape, the Embrace, pictured, is the smallest Fantasy Spa range option that is ideal for space-conscious customers. It comes in at 72” x 72”x 31”and has a dry weight of 302lbs and 205 gallon capacity. Two ergonomic seats are featured within the design, along with a ‘cool down’ area, and there are 17 jets that include dedicated foot and wrist jets. Coming in at 7’2”x 6’5” x 33” with a dry weight of 380lbs, the Entice incorporates a lounge seat and sweeping bench seat; 27 jets, including calf and foot jets; and has a water capacity of 260 gallons. A Therapy Seat allows users to relieve muscle tension with a deep tissue massage from the jets to target the pressure points in the neck and shoulder. The Drift, coming in at 70”x 62”x 33” with a 218 gallon water capacity and dry weight of 276 lbs, incorporates 17 jets, two captain’s seats and a waterfall feature that is adjustable to provide a full stream or shut off completely. 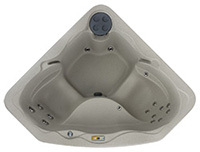 Like its Fantasy Spas stable mates, it has been designed with multi-colour LED lights and full foam insulation. All three models have two colour options of Granite or Sahara and have been designed to be virtually impervious to the elements, as well as being easy to clean. Hydrotherapy jets have also been included in the design, to allow users to target neck and shoulder muscles. Top-loading filters have been designed for easy access and quick cleaning capability; while standard equipment includes a grey ATSM safety cover, with locking clips, which incorporates advanced materials that are utilised in high-end spa covers. Certikin Marketing Manager Cath Saunders has been a committed SPATEX advocate for many years and is eagerly anticipating another successful exhibition when the exhibition returns for a second time at the Ricoh Arena. “We are looking forward to returning to the Ricoh Arena,” said Cath; “It should be another successful event for Certikin International and our products and services. “As well as our wide range of wet leisure products, supplies and accessories we will also be highlighting our hot tub range to our current and prospective Caldera Spas retailers. “It will also give us the opportunity to fully promote the new Fantasy models to our current and prospective Caldera Spas dealers. “Quite simply, the new Fantasy range stands head and shoulders above the rest when it comes to good looks and value for money. 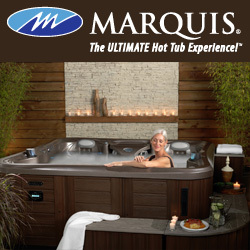 “This is an ideal range for our retailers with customers that are looking to take their first step into spa ownership with a user-friendly entry-level model. The Certikin team; including Cath and Certikin Director Ben Studdy, who has been spearheading the promotion of Caldera Spas; will be available to discuss the dealer opportunities for the Caldera Spas brand and Fantasy Spas range at SPATEX from February 1 to 3 on Stand D10 and D14 in the Jaguar Exhibition Hall. SPATEX opening times are 9:30am to 5pm on February 1 and 2. The third day, February 3, is open from 9:30am to 4pm; and will be including the first ever dedicated ‘Spa Day’ organised and hosted by SPATEX. Filed Under: Event news, Events & expos, News, News & views Tagged With: Caldera Spas, Certikin, Fantasy Spas, SPATEX, Watkins Manufacturing, WhatSpa?